I arranged a blind date with a Brazilian girl I'd seen on campus through a Brazilian Portuguese professor at the U of A. The party was an Argentine gathering and many members of the International Student's Club, of which I was a member, were invited. The Brazilian girlfriend of my roommate went to the party with my blind date. My roommate and I spent the day swimming at a pool and drinking beer so when I arrived at the party I was beet red and a bit sloshed. My blind date was overwhelmed because she was an African Brazilian and was expecting a tall black man. Surprise! However, my ability to dance, even when sloshed, impressed her and she accepted a second date with me during which I was the perfect gentleman. Two years later we were married on Feb. 13, 1971 at St. Alban's Episcopal Church in Tokyo, Japan. That was 44 years ago and we're still dancing! Plus we have two sons and five grandchildren. 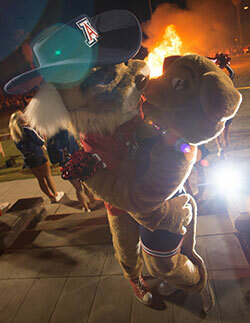 A U of A love story!